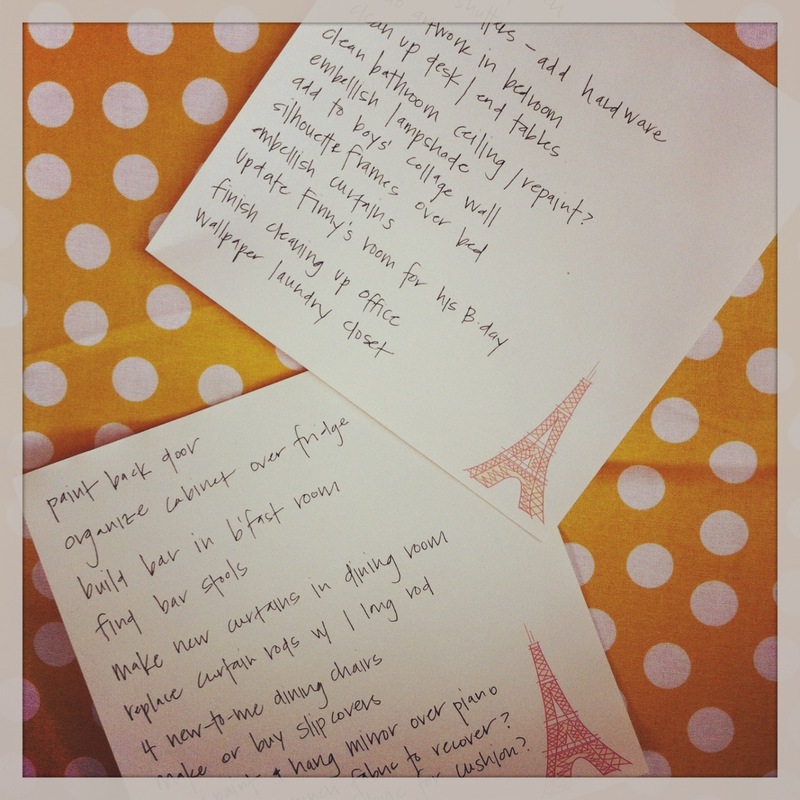 Every season, I make an around the house to-do list of all the projects I want to tackle. These projects range from hanging a new light fixture to framing artwork to painting the porch floor. There seems to be something about a change in the weather that inspires me to get busy being productive and creative. A few days ago, this season’s inspiration struck and the result is the following, ever ambitious, list. By the looks of it, you’d think we have no furniture in our house and that the walls are completely bare, when, in fact, the situation is quite the opposite. So why do I feel the need to tackle all of these projects? It’s a question I come back to often and a question I considered before starting this blog. Do I like being busy? Do I just want more stuff? Am I dissatisfied with something else in my life? For me, the answer to all those questions is a resounding, “NO!” I like to tackle these DIY projects because I enjoy the process. I love the experience of living in an old house with my young family. I love when ideas pop into my head about how I can help us live better or more fully in this space. A sense of anticipation bubbles up when I set aside the time to hunt for the perfect inspiration piece to accomplish that goal. I get excited about the possibilities when I gather objects – often those that have been discarded, tossed aside, deemed worthless and old – and imagine how to give them a new life in a old home. It’s pure joy to me to work in steady silence, with hands-on and hands dirty, to create a final product that may be nothing that I envisioned, but that I know has been worked out to suit my family and our home. If this process sounds a bit spiritual, that’s because for me, it is. The act of creating is a beautiful thing. It engages the hands, the eyes, the mind, the heart, and the spirit. For me, writing a list is only the beginning of my creative process that helps me dream about the possibilities. Make it your goal to live a quiet life, minding your own business and working with your hands…. Come spring, if I cross only one project off of my list – which is highly likely, by the way – I will be thankful that I had at least one opportunity to express my creativity in my home this season.